Test For: All Candidates who are going to appear in a Test for Admission or a Job. 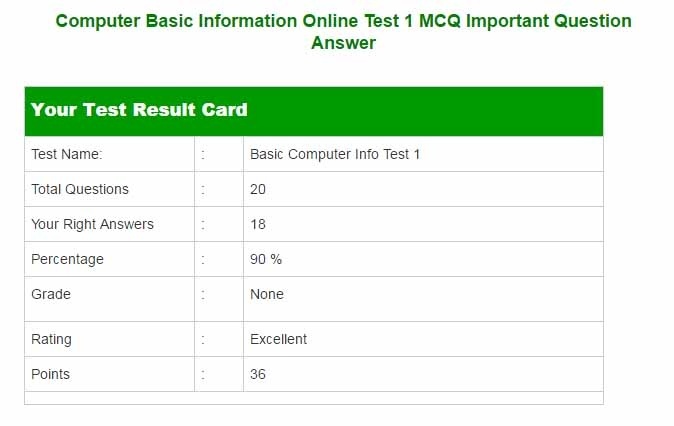 Here we have provided Online Test about Computer Basic Information. The modern era us all about computers so one needs to have at least basic knowledge about computers. The questions about computers are asked in almost every tests whether it is for admission in some institutes or for recruitment purposes. We strongly recommend to all of our visitors that they attempt these tests more than one time after completing the preparation so that you can prepare for the actual exam in the best possible way. Exam that are mentioned above.Candidates who want to Appear in any above Test can now prepare their Exam here through our Online Testing service. Rate and also share Your Ideas and Suggestion about the Test, Below in Comments Section. If you find any mistake in a test, kindly do mention the complete question and correct answer in the comments section under that test. Your comments will help us a lot in making our online testing service more accurate and reliable. Got 95%, but I want to say the URL> Stands for Universal Resource Locator not the Uniform Resource Locator, please verify it.